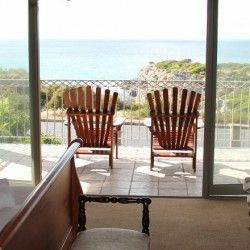 AmaKhosi Guesthouse in Hermanus is a 4 star graded establishment located in Sandbaai, a short stroll from the sea and 5 minutes from the centre of town. Hermanus, a historical fishing village and the world’s whale capital, is a tourist ‘hotspot’ with quaint market shops, breath-taking scenery, numerous adventure options and a variety of excellent food and wine outlets. Southern Right Whales visit the area from June to December each year – these beautiful creatures can be viewed by boat, by plane or from the shore. Hermanus boasts the world’s only Whale Crier who blows his kelp horn when whales are spotted. Accommodation at AmaKhosi Guesthouse is provided in 4 spacious en-suite guestrooms styled in warm African theme. 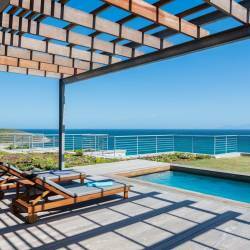 Each room opens onto a balcony with views of the ocean, gardens or mountains. The rooms are equipped with DSTV, mini fridge, tea/coffee facilities and a safe. An appetizing breakfast buffet is included in the rate and served in the dining area. Enjoy a relaxed holiday soaking up the sun on the beach or alongside the swimming pool, exploring the charming town or getting up close with whales – Hermanus has something for everyone! Rates below are valid for 2015 and include a healthy Breakfast buffet as well as English breakfast.